I will demonstrate the superiority of the worker-cooperative model in the home healthcare industry, before showing how the rise of digital, peer-to-peer “sharing economy” platforms present a potential threat to all agency-based home healthcare businesses, including cooperatives, by operating with a much lower overhead and exploiting the peer-to-peer relationship and data generated by users of the platform network. I will then discuss the notion of platform cooperatives as a possible intervention that homecare coops can use to obtain an advantage in this situation, as well as challenges to the feasibility of this intervention (access to capital, primarily). Relying on the postcapitalism hypothesis proposed by Paul Mason, I will speculate on the ability of future healthcare platform cooperatives to disrupt price formation in this industry, dramatically reducing costs to consumers while protecting workers quality of life and contributing to a transitional economy by “outgrowing capitalism”. As a part of my internship with a local Co-op Development Center, I am working with a home healthcare startup that the Center is incubating by providing a loan and office space as they go through incorporation, licensing and recruitment procedures before beginning operations. As a business they will provide in-home non-medical assistance to clients with disabilities, such as help with cooking, cleaning, bathing, taking medicine and general companionship. Homecare workers are among the lowest paid workers in the healthcare industry, and are predominantly women, immigrants and people of color. Unionization rates are low, the hours can be inconsistent and benefits are often non-existent. Average pay for these workers in the United States is often at or below minimum wage. Many home health aides live below the federal poverty line, and rely on government assistance programs to get by. But why are the workers performing such socially necessary labor so woefully underpaid? A study completed by the National Employment Law Project showed a variety of benefits for home care workers and employers if a $15 per hour wage was set as the industry standard, including better service, lower reliance on public assistance and higher worker-retention rates. But most for-profit homecare agencies are unable to provide this wage, particularly for caregivers working with low-income clients receiving assistance through medicare and medicaid. In addition, in-home health care and assistance is projected to grow five times faster than jobs in all other occupations in the United States. 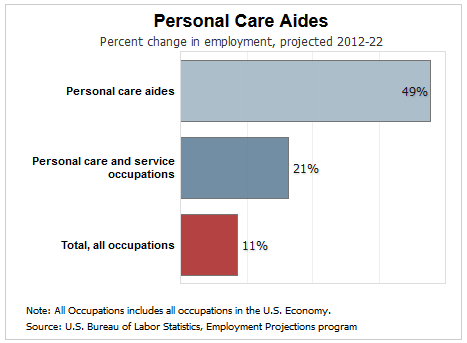 According to the Bureau of Labor Statistics, the country will need one million new home care workers by 2022. Driving this need is an ageing demographic crisis. 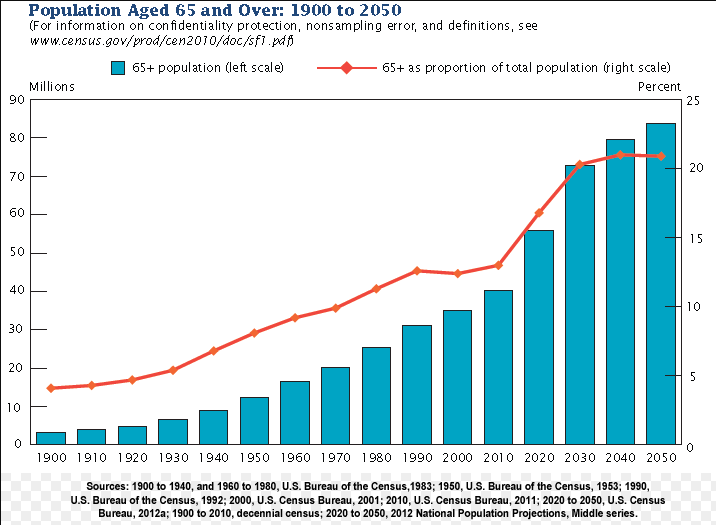 By 2020, for the first time in human history, the number of people over the age of 65 will outnumber the number of people below the age of 5. And by 2050, the number of people ages 65+ will total just under 1.5 billion, or 16 percent of the global total population. The existing system for eldercare, let alone for disabled patients is already stretched to the breaking point, even in countries with robust national healthcare plans. With rising demand, and falling ability to supply it, the home health care industry appears to be headed towards a situation of market failure in the next 30 years unless something changes. Thankfully, homecare coops and the many other worker-owned cooperatives built around caring professions may be uniquely suited to help. Cooperatives have been proven to be adept at operating in areas of market failure, such as food distribution and rural electricity, and are able to address the needs of a community, market or population when governments and the private sector fail to. But why? Homecare cooperatives, owned and democratically controlled by the care providers who staff them are able to provide better outcomes for workers and clients, in an industry known for low wages, long hours, difficult work. A democratic management system encourages workers to stay at their jobs in an industry where 60% annual turnover rates are common (co-ops frequently manage 15%). Collective ownership ensures that profits are returned to the workers, wages remain livable, and high quality training can be provided to give clients the best possible care. All of this goes towards the maintenance of a more sustainable organization providing a vital, yet frequently overlooked public health service. From Quebec to Japan, the cooperative model has proven itself more than adequate to meet the challenges equitably for everyone involved, and cooperatives are a well-established business model in the industry. For context, Cooperative Homecare Associates, founded in the Bronx in 1985, at 2,300 members, is the largest worker co-op in the United States. Their success did not come without struggle, and new co-ops in the industry face significant challenges from for-profit agencies, cuts to national and state healthcare programs, Anti-worker, monopoly-friendly legislation and looming on the horizon, automation. The Sharing Economy: Innovation or Exploitation? How can home care, a very personalized, regulated and hands-on job, be automated? The same way many low-wage industries, from taxi-driving to hotels are being automated: by developing digital peer-to-peer platforms such as Uber and Airbnb, charging users a fee for use and exploiting the information produced by users on the network for free. These companies, backed by billions in venture capital, have disrupted long-established industries (including worker cooperatives within those industries) by slashing administrative overheads and thereby cutting costs to consumers, as indicated by Airbnb rates that are between 30 and 60 per cent cheaper than hotel rates around the world. This is undeniably a good thing for affordability, but it comes at a price to workers by eliminating unions, living wages, benefits and consistent hours as part of a movement in employment and capital known, ironically, to some, sincerely to others, as “the sharing economy”, or less enthusiastically, the “gig economy”. Love it or hate it, it appears that the sharing economy is here to stay. In fact, the global market share of such peer-to-peer networks is expected to grow from $14 billion in 2014 to $335 billion by 2025, and likely far beyond in the following years, though as I will show, the ability to price and privatize this sector may prove to be problematic. New startups are created, funded and sold at a dizzying pace, and it seems that few service industries will be safe from the peer-to-peer revolution, including homecare services. In fact, several clever founders and funders have already jumped on the idea. After all, home healthcare is expected to be the fastest growing industry in many countries. 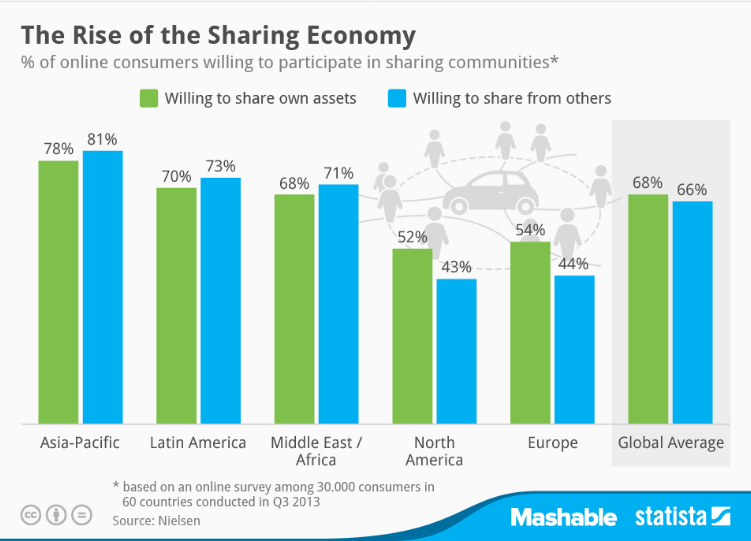 And as the following chart shows, people living in Asia, Africa and Latin America, including many countries with the fastest growing populations are even more likely to want to participate in the sharing economy than well-connected Americans and Europeans, where many of these companies are based. “And why not automate?”, many capitalists wonder. Using a networked approach care can be negotiated directly by the caregiver for a lower cost to clients, many of whom are unable to afford the services of traditional agencies and demand more of a personal relationship and choice over who looks after their loved ones. The numbers add up, and several growing platforms such as CareLinx and KindlyCare have already been founded on these principles and have proven adept at solving many of the systemic issues in the homecare business, saving families up to “50 percent versus traditional agencies, while caregivers earn up to 25 percent higher wages”. But a purely profit-driven approach to peer-to-peer healthcare could have negative consequences for quality of care for clients and quality of life for caregivers if the homecare if the issues of ownership and worker autonomy are not dealt with seriously. After all, there is currently no way to automate the entire process, as Sherwin Sheik, founder of CareLinx says, “I view the company as 25 percent technology and 75 people“. Building a sustainable worker-owned organization that takes these technologies into account and empowers caregivers to have both a direct line to their clients as well as the company policy would be revolutionary for the lives of underpaid workers and lower income clients in need of reliable, responsive care. For homecare, the benefits of Peer-to-Peer are obvious: a savings of 30 to 50 percent for clients and a higher average wage for workers with lower administrative overhead. 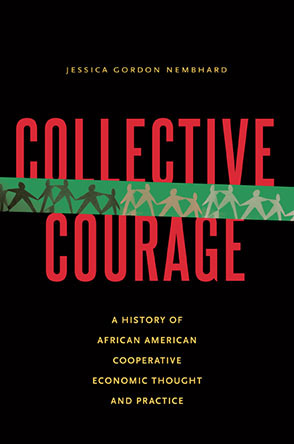 Unfortunately, many worker coops develop insular collective cultures that are highly resistant to change. The right approach in this case is not resistance, but adaptation. Many are rightly wary about the potential of the sharing economy leading to an era of alienation, atomization and digital feudalism. But the information economy is here to stay – and if theorists like Paul Mason are correct, may actually do more to bring about the end of capitalism than all the vanguard parties and sectarian radicals of history combined. And social and economic justice is not necessarily inevitable. It’s up to people with visions for a better world to help develop this century’s new means of production into technologies for liberation. Fortunately for us, we may be getting an unintended boost from the very people seeking to control and exploit us with these technologies. To quote Mason, “Information goods exist in potentially unlimited quantities and, when that is the case, their true marginal production cost is zero. On top of this, the marginal cost of some physical info-tech (memory storage and wireless bandwidth) is also collapsing toward zero. Meanwhile the information content of other physical goods is rising, exposing more commodities to the possibility that their production costs begin to plummet too.” (Mason, 163). This tendency throws a major wrench in theories of marginal utility price formation that form the foundation of mainstream neoclassical economics. Why would someone choose to pay a premium, or anything at all, for a good or service (a pirated digital copy of the latest episode of “Game of Thrones” for example) that can be reproduced infinitely for free. All that stands in the way of significant growth of the peer-to-peer, non-market economy is legal protection of private property rights by governments and monopolistic tech firms. And for the exploited information economy to grow, even these monopolies are forced to undo these restrictions to further their own self interest. They currently operate by relentlessly mining, analyzing, and selling the data (identity, behavior and labor) of their users and eroding privacy and private property rights. Truly, in a condition of abundance and enforced scarcity, the contradictions of info-capitalism are quite obvious. As Robin Chase, founder of the ZipCar platform put it, “The old capitalist model of hoarding things, trademarks, copyrights, patents, and keeping everything closed because ‘that is how I’ll extract value’ is not true anymore.” More value can be created through open sharing of data in a large network (the value of which is proportional to the number of connected users squared). But despite the high value of open networks, the ability to price and extract profit from this value is questionable. The general conclusion of all this is that the power of cooperation and peer-to-peer social production enabled by ubiquitous information-imbued commodities can be exploited for a narrow profit margin, but cannot, in the long term, be outcompeted or owned. As it emerged from the early experimental internet, capitalists were among the first to exploit the new digital commons, but as I will show, cooperatives and other collaborative, non-market social institutions, are the most fitting inheritors of this line of development. Who owns the apps that we use everyday, from hailing a ride to social networking? I most cases, a private company, which exploits the work we put into the network for profit by selling data to advertisers, optimizing their algorithms and commodifying everyday activities. But what if the users owned that data? This is the basic idea behind platform cooperativism. From the informal chaos of early peer-to-peer networks like torrent sites to the exploitative hierarchies of silicon valley tech corporations, cooperative entrepreneurs around the world are experimenting with engineering democratic and fair networks which prioritize the wellbeing of their users over an investor bottom-line and seek to aggressively disrupt business as usual. Any existing business model in the sharing economy can be cooperativized, including platforms which negotiate pay for services, like transportation, healthcare, finance and house cleaning. One of the perennial strengths of the cooperative movement has been the ability of individual firms to federate together for mutual economic, social and political benefit. This ability is a major component of the cooperative advantage, which allows co-ops to share resources, members, raw and finished materials – and most importantly information – between each other without the ordinary restraints of competition imposed by the market logic of investor-owned firms. Mondragon, arguably the world’s most successful co-op, is essentially a massive federation of cooperatives working in an extremely diverse coalition of different industries, from finance to manufacturing to supermarket chains. Platform Cooperativism and other digital models of cooperation such as Digital Commons Licensing, Peer Production and Open Cooperativism may turn out to be the next step in cooperative federation, facilitating open communication between members pooling their resources for the collective benefit. Given all of the information above, the case for a caregiver’s platform cooperative is quite clear. The homecare industry is predicted to be the fastest growing industry in the United States, peer to peer platforms have been shown to be effective business models for coordinating the work, and worker-owned cooperatives are proven to provide better outcomes to patients and caregivers. What are the main challenges a scalable homecare platform coop might face? The most obvious is common to most coops, but becomes even more of an issue in the tech-startup world: Capitalization. Most sharing platforms depend on huge investments of venture capital due to the risky nature of their projects, high startup costs and the potentially huge rate of return should the business take off and the investors and owners are able to sell. This is not what cooperatives are about, and high-flying investors and banks are reluctant to fund such a project. Existing platform coops have been able to get started on shoestring budgets from smaller grants, loans, and crowdfunding campaigns, but lack the massive injection of capital needed to grow the business rapidly and help them stand out in the chaotic software development market. Finding adequate funding to grow beyond the regional market will be key to becoming competitive in this field before it is too late. It’s up to people with visions for a better world to help develop this century’s new means of production into technologies for liberation. Another issue is the uneven state of regulations surrounding homecare work, particularly in the United States. Some states, such as Washington and California, require strict licensing and training for caregivers and management agencies, while other states have very few. Developing a business model that accounts for these regulatory requirements, is flexible enough to work across states and international borders and is responsive to workers needs as an internally democratic organization will be a crucial code to crack before a scalable homecare platform can really begin to take off. It is here that the principle of federation might be of use. Some platform cooperatives have been built on a federated model, with the platform being owned by a group of individual cooperatives, including its developers, rather than on an open-membership model (This is the general structure of Up-and-Go, a NYC-based house cleaning platform). In homecare this could look like a platform owned by existing coops in various regions pooling their resources to get greater visibility and access, marketing their services collectively, with membership options for freelancers and clients who wish to commit to the network for shared benefit. This way, cooperative agencies and freelancers could deal with the regulatory requirements of their own city, county, state and country, while gaining the benefit of a sustainable, flexible peer-to-peer network that would help them cut overhead administrative costs and add value to their coops through enlarging the network. One organization, Carina, through a partnership with Washington State DSHS and SEIU 775 is providing a not for profit platform for individual care providers and clients to connect, and may be a potential partner for Homecare coops in Washington state. Capitalism, and by extension the livelihoods of nearly everyone on earth, is likely to find itself in a very tight spot in the next 50-100 years. Information technology is eroding the ability to match prices to commodities, and forcing firms to adapt by monopolizing, even as they watch their profit margins fall. Demographic ageing is building towards a massive demand without a supply of health services to meet it, fueled by underpaid workers, underfunded governments and prohibitively high costs. Climate change and financial recession loom like thunderheads off in the distance. For the majority of people on the earth, the ever-present question of survival is becoming increasingly de-linked from work and wages, as traditional sources of employment and industry collapse, downsize and automate. The class struggle has become not just the struggle for fair day’s pay for a fair day’s work, but for freedom to define oneself apart from work, as the holder of multiple, creative, active networked identities and idle pursuits. The gig economy is growing rapidly, and suits this turn in lifestyle well, but is unable to meet the needs of its most vital components: its users. For the diverse workers, caregivers, drivers, artists, teachers, hackers, students , parents, scientists, migrants and entrepreneurs of the world to unite in solving these problems, we will have to find a way to outgrow the constraints placed upon the freedom of the global economy to provide just outcomes for all. We will have to outgrow capitalism. But to do this, cooperation, courage and innovation will be necessary to discover and exploit opportunities as they arise, to find the cracks in the system and fill them with better forms of organization and distribution of wealth. The old Soviet dreams of transforming the world economy through force and decree have long since been debunked. But this by no means proves that history itself is ended, and that neoliberal capitalism is its final equilibrium. Marx may have been right in claiming that capitalism contained the seeds of its own destruction, but mistaken about just what those seeds may look like. If we are to avoid ecological catastrophe mass extinction and humanitarian crisis in the 21st century, and more broadly the anthropocene, strategies towards a just transition must be relentlessly pursued, and all effort must be made to bring everyone, especially society’s most vulnerable, safely along for the ride. The work that the founders of Capital Home Care Cooperative and others like them all around the world are vital for this effort. We can build all the flashy technology and spout the most radical rhetoric, but if we aren’t caring for the disabled and the elderly and the workers who care for them, and all the people in society, waged and unwaged, who do the socially necessary labor to reproduce everything else, the whole project is likely to fall flat on its face, and civilization will be left to wallow in a dystopian future we are not prepared to wrestle with. The upside to all this seemingly impending doom is that the only solutions that will see us safely through are also some of the most hopeful and utopian, in that they must meaningfully improve the material and social quality of life for everyone on earth. As I wrote previously, surviving the 21st and 22nd centuries is going to be an act of unrivaled speculative realism (also known as “science-fiction”), the likes of which the planet has never seen. And it is often the smaller stories, the stories of caring, creativity, collaboration against adversity, like the far-too-thankless work done to care for disabled and elderly people around the world that is most likely to change someone’s heart, and show them their own potential as an agent of change towards a better future. Mason, Paul. Postcapitalism: A Guide to Our Future. Farrar, Straus and Giroux, 2015.